Kuffar. Beautiful. Cross-dresser. Brave. Strong. Confused. These descriptors comprise just a few things I’ve been called in the last several years. I hope that through this article, I can succinctly paint a picture of my religious journey as a queer hijabi, and how my sexual orientation and gender identity have informed my journey towards the Divine Mystery. I was born into a conservative Christian family, in a small city in Ohio. “Bible-thumper” is a term which could accurately be applied to the workings of the church I was raised in. While the terms transgenderism and transgender did not enter my lexicon until my junior year of high school, I knew there was something different about me. Small evidences of this peppered my childhood. For instance, even as a 7-year-old, when I engaged in pretend play with a neighborhood friend, he would play the husband, and I, the wife. While he graciously extended acceptance, telling my wife was more difficult and led to many tears, mostly on my part. Revealing this to our parents proved even more difficult. I wrote a letter to my mother, and Carolyn told her parents when we visited them in April 2015. My mother had a depression spiral and my in-laws encouraged my wife to leave me and move back home. Similarly, my siblings didn’t accept me. Thankfully my in-laws have come around, but my immediate family, except for my younger brother, still refuses to call me by my new legal name. My eldest sister went as far as to claim she didn’t feel “called by God” to call me by my new name. Please don’t misunderstand though. Even though my family’s actions are unaccepting, I don’t think they are bad people; just confused. My transition has shaken their worldview to it’s core. My religious path has meandered through Paganism, Episcopalianism, Eastern Catholicism, and almost a year ago, I begin practicing Islam. My journey home to “Al Sirat-al-Mustaqim” was a long one of over five years. However, I told God that if two conditions were filled—firstly that I had no major issues with anything in the Qu’ran, and secondly that I found a welcoming Imam—then I would revert. I’ve found both in the Islamic House of Wisdom in Dearborn. 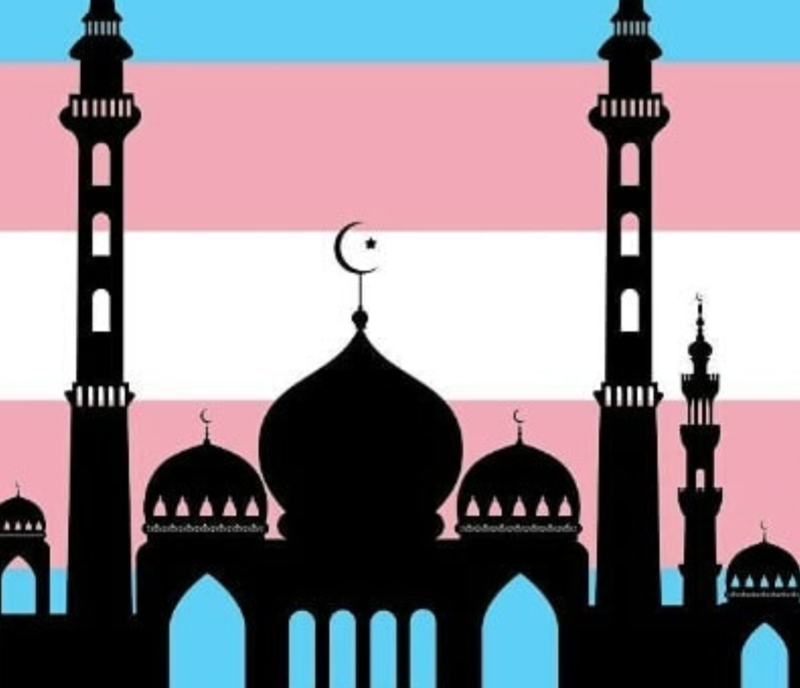 I came out to my Imam when I met him after my first Sunday service and he told me, “Catriona, if your doctor considers you female and your I.D. says you’re female, then you are a woman.” In fact, before I made my formal Shahada in March of 2018, I met with my Sheikh to open up about the pain I have felt through the rejection of my family to the point that I cried. He told me that although I was going through hell with my family, I should still try to be an example of peace and love. Salah, especially, has helped me feel more at peace and fall more deeply in love with Al-Wadud, and feel His embrace. Though I know I am endlessly loved by Allah, my journey as a trans-hijabi has been tumultuous, and has sometimes filled me with trepidation. Even writing this article is scary for me, because I’m fearful of the judgment that will be passed down on me. Amid this fear, I try to introspect. Am I afraid because my intersectionality makes me wonder if I’m disloyal to the LGBTQIA+ community—a system that often, at best, states that as a queer woman I need to try to be in a halal relationship or at worst that I deserve to be caned or stoned to death? Or is it because I’m afraid that who I am will get in the way of allowing myself to be a vessel that the Divine Love can travel through to others? Whenever I get afraid though, I draw strength from the example of our Beloved Prophet, peace be upon him. Because if he can make it through losing all his children except for Lady Fatima, peace be upon her, and survive being reviled by his countrymen through the help of God, inshallah I will have faith that God will protect me. He will surround me with people who love and support me. I also draw strength from the love of my wife, who has stood by my side for the past 9 years. And I hope that through reading this article, at least one reader will know that they are no less loved by our Lord, and All Compassionate One.